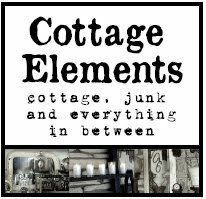 Cottage Elements: A New Year . . . A New Magazine! As we go into a new year, I'm here with great excitement and anticipation to introduce the new year with a new magazine and DVD! 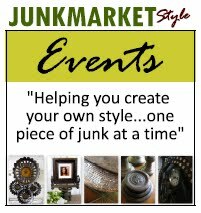 As a contributor on the JunkMarketStyle website, I received an e-mail from Sue Whitney, President of JunkMarketStyle, announcing the release of this new magazine tomorrow and I'm here to spread the word! Here's what Sue had to say . . . .
Yay! Fresh off the presses and video camera comes a JUNKMARKET dynamic duo. This is so exciting. Let me give you the skinny on this product. 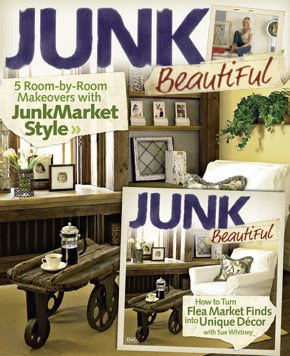 The magazine is a 48 page excerpt from my current best-seller, Junk Beautiful- Room by Room Makeovers with JUNKMARKET Style, highlighting the best of the best from the book. 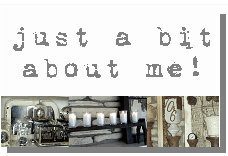 It includes 5 room makeovers along with many of my favorite step-by-step projects. If you don't already own the book this will leave you yearning for more and there is indeed plenty more where this comes from. What's totally new and fresh? Something that we here at JUNKMARKET have never done before....a DVD. Woo hoo! The DVD includes a flea market shopping experience including all the tips and tricks, a style file, three different bathrooms three different ways, a creative workshop section with me, Kimberly, and our new Junk Hunk, Brandon, a video version of my daughter's bedroom makeover, and a personally guided tour through the "House That Junk Built". That would be my home! I have to say that this may be one of my favorite junking experiences ever...and that speaks volumes. We had an outrageously good time, shooting, writing, creating, and producing this DVD for you. I hope you have as much fun watching it as we did making it! The cover price is a bargain at $12.99. The contents will totally give you an upper-hand on how to cut costs and raise the coolness meter at the same time. Now that's a two-fer. This will be released December 30, 2008...tomorrow! I actually saw this new magazine/DVD at Barnes and Noble just the other day but because it was sealed in plastic and I already own the book I did not know what all was in it so I didn't get it but now after reading more about what is on the DVD I just may have to hop on out and get it. I would love to have a tour of her home. Amazing ideas....I love it. Thanks for sharing the info. Happy New Year from Eileen and the Beautiful Starry Girl. I am excited to see this! Honestly, not sure if I need the magazine since it is a repeat of the book, but i want to see the DVD. I will be going to B&N shortly. Thanks so much for sharing. Also, I use to go to the Round Barn in Andover but the last time I was up there (Sept.2006) it wasn't there anymore. I use to go with my aunt and cousins and we had such fun tooling around. We always found treasures that I would have to haul back to FL. Did they relocate? I'm going to try to pick this one up for my mom. I'm sure she will love it.